SINGAPORE - With a chunky physics textbook laid out in front of him, Singaporean Mark Sim is a picture of cherubic enthusiasm as he flips through the pages, pointing out the topics he is particularly fond of. "I like electricity, and oh, atomic physics because my dad explained to me how bombs work. Although I find the property of waves a little hard to understand..."
That caveat, tinged with child-like uncertainty, is a reminder that the soft-spoken Mark is all but nine years of age - but already believed to be the youngest person in the world to score an A in the International General Certificate of Secondary Education (IGCSE) physics examination. The IGCSE is an internationally recognised qualification equivalent to the GCE O-levels. Mark was eight years and three months old when he took the exam - consisting of three papers spread out over two days - at the British Council last November. The feat earned him a place in the Singapore Book of Records when his result was ratified earlier this year. "We tried to check with Cambridge if he was the youngest in the world, but they don't keep such records," Mark's father, Mr Harry Sim Lim Onn, 48, told The Straits Times. Mr Sim had originally intended for him to take the GCE O-level exam, but the Ministry of Education would not allow it as they had imposed an age limit in order for parents not to put undue stress on their children. It cost Mr Sim $300 for his only child, now a Primary 3 pupil at Nanyang Primary, to take the exam. But he reckons it was money well spent. Mr Sim, a Singapore permanent resident from Malacca who has lived here for 27 years and is married to Singaporean Wun Ju Sing, 46, revealed that Mark displayed a precocious talent for grasping basic physics concepts. "I was explaining to him about acceleration and how my car differed from a Ferrari when he was six years old, and to my surprise, he understood," said the section manager at a semi-conductor firm. Mr Sim subsequently bought Mark a physics textbook, and the boy was hooked when he was told it was meant for students aged 15 years and above. For a year leading up to the exam, Mark would study for half an hour every day on weekdays, while Mr Sim spent up to three hours on weekends coaching him. But both parents, who graduated from the National University of Singapore with bachelor degrees, were keen to stress that Mark was unlike the usual geniuses who were born smart. Singaporean prodigy Ainan Cawley, for instance, set a world record at seven when he passed his chemistry O-levels in 2007. "It took Mark a lot of hard work and determination, along with a commitment on my part to allow him to focus on something he was really good at," said Mr Sim. "His English was not very good to begin with and he had to make an extra effort to improve in order to fully understand the questions." In fact, Mark's growing up years were a source of constant worry for his parents, who feared that he might have been slower than other children. "Our maid warned us not to expect too much from Mark; for example, he could not roll over on his own until he was nine months old," revealed Mr Sim, who has written a book about his parenting experiences. "He was also constantly at the last of his class in kindergarten." Madam Wun, an accountant-turned-housewife, supervises Mark's daily schedule and coaches him on other subjects such as English and Mathematics. She is also his constant "sparring partner" in chess. 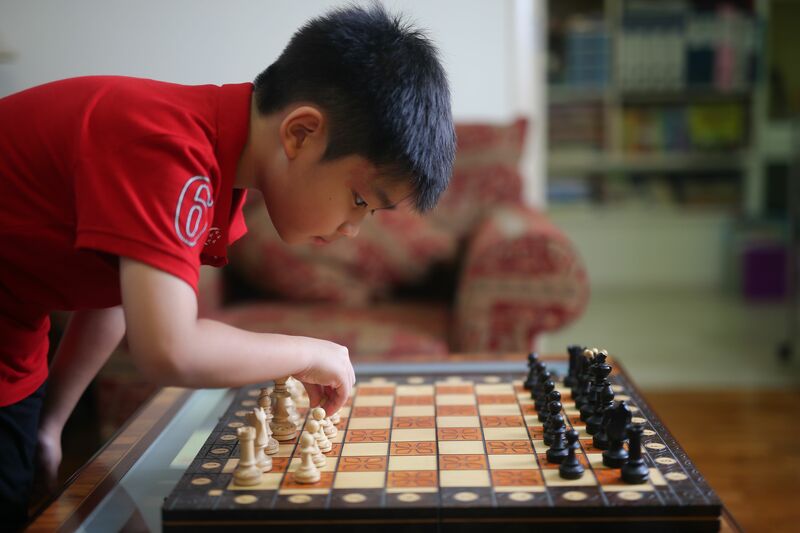 Mark was previously a member of Singapore's national junior chess squad, but he left last year in order to concentrate on preparing for his physics exam. And Madam Wun says that her son also enjoys computer games and travelling overseas - his small but tidy bedroom is filled with books a child his age would read, while he is also a huge fan of the film Minions. "He has been getting attention in school and his classmates know of what he has done, but we try to keep him grounded and down-to-earth," she added. So what's next for Mark? There are plans for him to take the A-level physics exam within the next two years, although Mr Sim is wary of the demands of such an undertaking. "Mark was the one who suggested it. He dragged me to the bookstore and made me buy the A-level physics textbook," he said. "We'll take it slow but he should have no problems scoring a B or C with the right preparation."